Every camper and counselor who has been a part of Merrick Woods will always be a part of Merrick Woods. To sign onto the guestbook, all you have to do is click the link below and fill out your information. 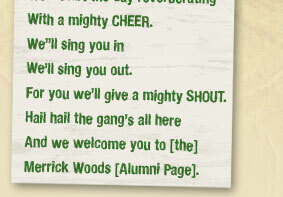 Then you'll be able to search for old friends, upload photos, and post messages onto the Alumni Message Board. If you have any questions, please feel free to send us an email, and never hesitate to contact us with any suggestions you have for the Alumni section of the website.